Late blight strikes tomatoes and potatoes all over North America at any stage of growth. Irregular gray spots form on leaves. White mold grows on the undersides of these spots. Infected leaves turn brown and dry up. 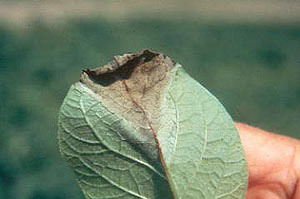 Gray, water-soaked spots on infected fruits later turn dark brown and corky. Infected tubers are covered with brown spots where rot begins. Wet weather with cool nights and warm days favors the spread of the disease. The fungus overwinters in infected plant debris. Fertilize judiciously, as excess nitrogen favors the disease. Avoid overhead watering. Eliminate infected plants with a flame weeder to prevent further spread of the disease. After potato vines die at the end of the season, wait a week before harvesting to avoid infecting tubers. For early harvest, first destroy plant residues with a flame weeder before digging tubers. Copper fungicides such as Bordeaux mixture are effective as a preventive when applied as directed on the product label, and may afford control if applied as soon as infection occurs. It's best not to depend too heavily upon this method of control, as copper can build up in soil to levels toxic to earthworms and microbes.